Before launching Trazza, Claude Karam was a commercial airline pilot. After 15 years of service, though, the demands of the job became a hindrance to his dedication to his family life and his own personal dreams. Claude began carefully discerning an alternate career that wouldn’t include frequent travel – alleviating strain on his family life – yet a career he could have the same passion for as he did for flying. Inspiration came late one night, on the way home from the airport following a four-day trip. He was stopped at a traffic light near a local grocery store, which also featured a well-known coffee shop inside. This sparked an idea – an idea of producing and serving authentic Lebanese food in local retail stores, just as this coffee shop was doing in this grocery store. The wholesome Lebanese foods Claude’s family had always served in their home were nutritious by nature, yet also quite time consuming for the average person to make from scratch in their own kitchen. As he explored existing store-bought brands, Claude realized the flavors didn’t reflect the authentic Lebanese food he had grown to love. In addition, he was desiring to create a more natural food product without preservatives. Making fresh Lebanese food readily available to the local shopper was a need he became eager to fulfill. His first efforts began with pursuing Fred Meyer and New Seasons Market. The initial response was favorable, but rather than creating and serving fresh Lebanese food in the stores, the stores wanted his food already made, prepackaged, and ready to eat, to the stores for retailing. And so, Claude tweaked his idea and took the first step. 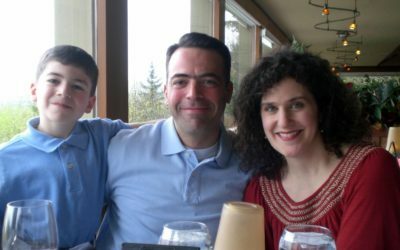 On his days off at home, Claude, his wife Gennifer, and their son, Joseph, began experimenting with recipes in their kitchen (and having fun in the process). 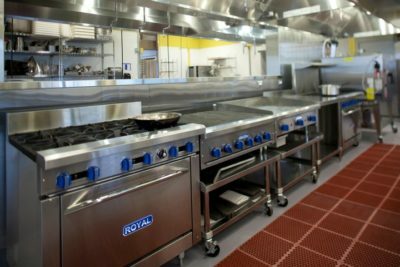 From home kitchen to commercial kitchen. Once Claude realized their food would need to be packaged, he thought to manufacture it from their home kitchen. Then a packaging supplier told him about a great commercial kitchen known as “KitchenCru.” This seemed like a more practical solution, and so his small team began producing their original products from KitchenCru: Mihshi (stuffed grape leaves), original hummus, baba ghanouj, tabouleh, and baklava. KitchenCru, in many ways, was Claude’s “culinary school.” There, he learned the basics about food prep, cooking, kitchen terminology, and kitchen equipment while being exposed to great local chefs whose passion was food innovation. At this point, he took a long-term leave of absence from his flying career and began presenting the food they made at KitchenCru under the name “Karam” to local grocers such as Bales Marketplace Cedar Mill and Whole Foods Market. It was November of 2011 when Bales invited Claude to showcase the Karam food at an annual food and wine event. The public response was very positive and encouraging, and it was this event which opened the door for Bales to become the family’s first retail store in January of 2012. During this time, Claude’s efforts were focused on building a strong team as well as more clientele. He began to expand the product line, introducing their own falafel, garlic tahini sauce, and tzatziki sauce, as they served other local stores: Chucks Produce in Vancouver and Sheridan Fruit Company. By the summer of 2012, Karam began to serve their first national customer locally: Whole Foods Market. These first stores taught Claude much about the packaging and labeling of their products – what works and what doesn’t. It was a steep learning curve, but the process was both stimulating and fun. In the early days, when Claude did in store demos for Karam products, customers would often ask about flavored hummus. To him (and his deep-rooted Lebanese pride) adding anything to his hummus felt like an insult; not to mention the fact that flavored hummus is not exactly something you would find anywhere in Lebanon. It was a thought which just seemed contrary to his vision of keeping his products traditionally authentic. After consistent requests from customers, however, Claude reasoned that if they were asking for flavored hummus, he wanted to fulfill their request. It wasn’t long after that Karam introduced spinach-artichoke, sun-dried tomato-basil, cilantro jalapeno, Kalamata olive, and pomegranate-mint flavored hummus. Expanding product line and expanding retail outlets. With the success of the flavored hummus, Claude continued to introduce new products under the Karam label, starting with the Lebanese Lunch Box – a veggie mezza combo which includes a sampling of mihshi, original hummus, falafel, and tabouleh. Also introduced was a gluten-free version of their tabbouleh – substituting quinoa for bulgur wheat. In 2013, Zupan’s began selling Karam products in their Portland stores. Then, after nearly two years from his initial approach, Fred Meyer accepted Claude’s offer and Karam products were added to the local stores. In September of 2014, Pita & Carrot Hummus Snack Cups were introduced into New Seasons Market stores where they received an immediate positive response from customers. Natural Grocers and Vitamin Cottage were also added to their growing list of retail stores. 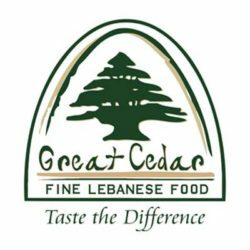 In 2015, while keeping their commitment to quality ingredients, Karam decided to change their business name to Great Cedar, to avoid confusion with other food products in the northwest carrying similar names. In 2016, the name was changed again to Trazza Fine Lebanese Food to further distinguish the company and its products as premium brand. Trazza combines the English word “Tradition” with the Arabic words “Tazza” (fresh) and “Mezza” (generous appetizers). The company logo, the evergreen and resilient Cedar of Lebanon, which had become strongly associated with Karam products, was left unchanged through the name changes – in fact, it is still a part of the Trazza brand. The Trazza family is 16 amazing team members strong and hiring! Today, the Trazza product line has expanded to include falafel, tabbouleh, stuffed grape leaves (mihshi), baba ghanouj, baklava, spanakopita, lentils and rice with caramelized onion (mjadra), garlic sauce (toum), tzatziki sauce, garlic tahini sauce, pita chips, 12 flavors of hummus, and two grab-and-go wraps (falafel and hummus). Trazza Fine Lebanese Food continues to grow, while manufacturing its food from a 7300 square foot state-of-the-art facility in Tualatin, OR. Trazza now serves more than 100 stores and businesses in Portland, Vancouver, and Salem. They look forward to a bright future of serving wholesome and delicious Lebanese food to retailers and local businesses, as they respond to the needs of their customers. In the meantime, Claude enjoys being with his family more, and he’s found that he can be passionate about something other than flying. Pardon the pun, but for now, this pilot has landed. Trazza Fine Lebanese Food, formerly known as Karam, is established by former full-time airline pilot, Claude Karam. Food is manufactured at KitchenCru, a commercial kitchen in the Pearl District of Portland, OR. Bales Marketplace and Chuck’s Produce become the first retail stores to carry Trazza products. National chain, Whole Foods Market begins to offer Trazza products in their Portland Stores. Flavored Hummus is introduced, as well as the Lebanese Lunch Box. Zupan’s Markets is added to the growing list of stores where Trazza can be found. Natural Grocers, Vitamin Cottage and New Seasons Market begin carrying Trazza products. Pita, Carrot & Hummus Snack Cups are introduced, quickly becoming a popular and healthy Grab & Go option. Karam begins serving OHSU Hospital in addition to more than 65 outlets in the Portland/Vancouver area. Karam begins serving Kaiser Sunnyside and Tanasbourne Hospitals. Karam changes its name to Great Cedar to differentiate from other Pacific NW products using the Karam name. The final name change to Trazza Fine Lebanese Food is completed and trademarked. Trazza combines the English word “Tradition” with the Arabic words “Tazza” (fresh) and “Mezza” (generous appetizers). Trazza moves production to a 7000 sq. ft. state-of-the-art facility in Tualatin, Oregon, and is now serving more than 100 locations. The company also begins using new Inline Packaging for longer shelf-life and better delivery schedules, as well as more new product possibilities. Trazza products are now available in Salem, Albany, Corvalis, Eugene, Junction City and Cottage Grove. Trazza receives HACCP (Hazard Analysis Critical Control Point) Certification for its Tualatin manufacturing facility.